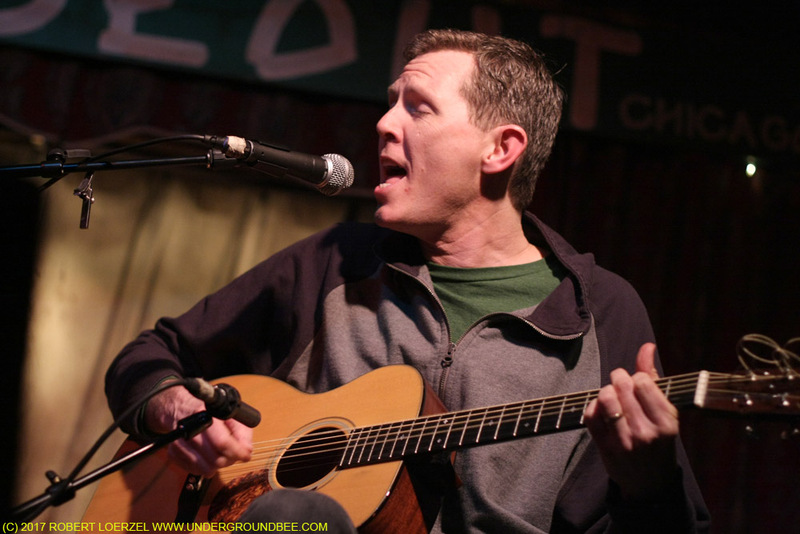 Robbie Fulks performs during the second show of his Hideout residency, on February 8, 2010. As it turned out, Fulks’ “residency” lasted way longer than one month. 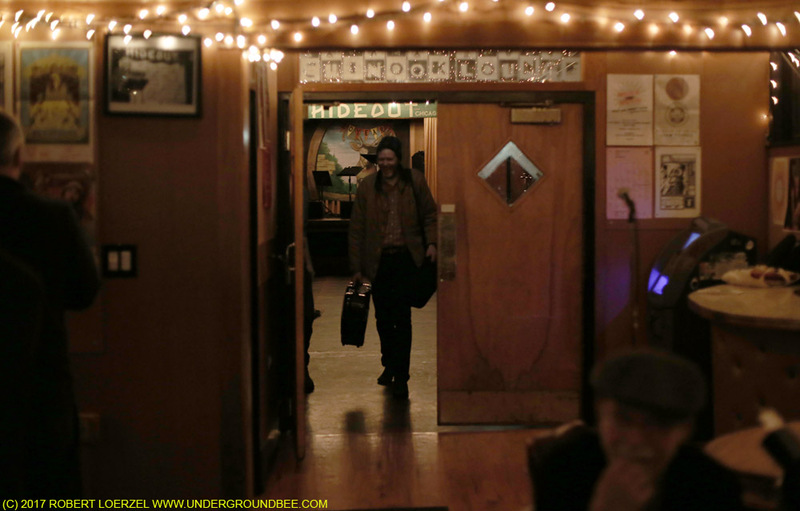 He just kept on playing at the Hideout on one Monday after another, bringing talented guest artists onto the stage with him and playing shows with a startlingly wide range of themes. Fulks is known as an alt-country singer, but these concerts showed just how varied his musical interests are — along with the old-fashioned country songs you’d expect, Fulks and his ever-changing cohort covered everything from Thelonious Monk and Stephen Sondheim to Liz Phair, Harry Nilsson, Bob Dylan and Cheap Trick. And man, was it glorious. Here are some things I was able to do under the circumstances, things I hadn’t done before: play Prokofiev; sit quietly for a minute between songs, tuning and thinking; play Charlie Parker; tell 10-minute off-the-cuff stories; try out tunes on clawhammer banjo, ukulele, bass, mandolin, fiddle, and other instruments not native to me; play a 15-minute noise-drone improvisation; reharmonize songs by Bob Dylan, Wayne Shorter, and the Monkees, among many others; listen hard for the first time to people like Leonard Cohen, Danny Elfman, Stephen Sondheim, Blake Babies, Sonny Boy Williamson, Arthur Russell, Ty Segall, and Donna Summer; transcribe Doc Watson’s version of “Beaumont Rag”; collaborate with Michael Shannon; jam with Jason Adasciewicz; take off my pants in front of a paying audience; back up Liz Carroll in time signatures such as 9/8; use guitar pedals like Plimsoul overdrive and something called “Freeze sound retainer” which is truly wonderful and flummoxes both accompanists and house sound people; improvise country underscoring beneath country storytelling; play Jimi Hendrix. Some of this I do regret. However, I see now that I deeply regretted aspirational actions like playing the bass guitar on “Who’s Gonna Mow Your Grass,” or trying to comp an unknown Gershwin piece at high tempo, in the moments I was doing it, then let it go immediately afterward. This marks clear progress for me from the days when I’d forget a lyric or do something stupid in public and then experience burning blood to the face when the memory arose months or years after. The little humiliations were so ongoing for me during this series that I normalized them and was able to get over myself, at last, here at age 53. You saw *how* many concerts?!? My friend Heather Copeland was there practically every week, too — holding up her little camera to record video of just about every song. She has posted hundreds of these videos on YouTube, and it’s well worth your time to sample those. (I’ve included links to several of the videos in this post.) Fulks gratefully gives her credit for helping preserve his performances, though he occasionally mentions that he’d rather not see certain moments displayed for everyone to see on the internet. For the first three years, Heather kept a list of every song Fulks and his cohort played at the shows she attended — coming up with a tally of 1,069 different titles. Most of these are songs that Fulks and his guests played only one time. Around 170 songs were repeated once or twice. The grand total number of songs Fulks played over the course of the seven years is well over 1,000, considering that he played hundreds of additional songs in the four years missing from Heather’s list. 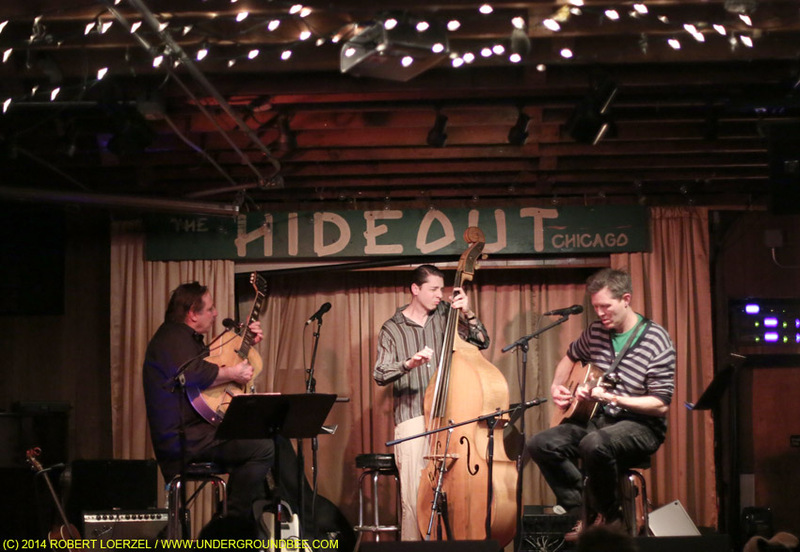 Instead, he used his regular spot on the Hideout’s schedule to showcase other musicians and stretch his own repertoire by playing with them. 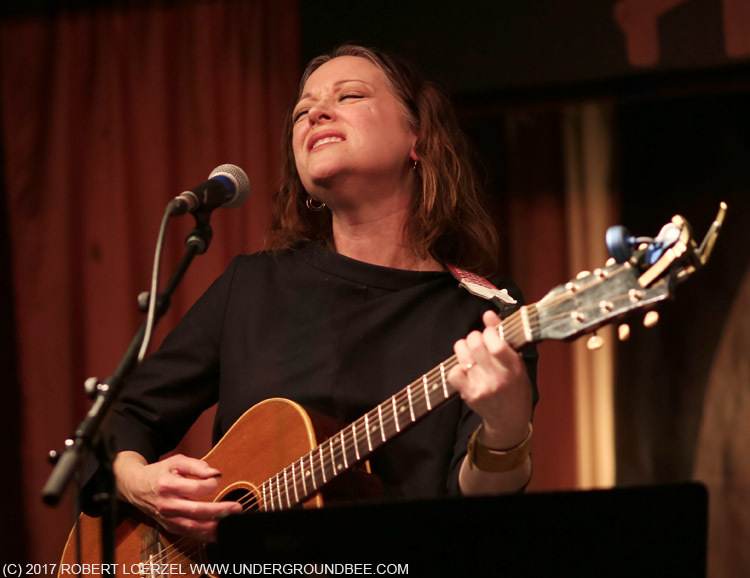 I missed the very first night of the residency in 2010 — when Fulks played with his stalwart sideman Robbie Gjersoe — but I was there for the second week, February 8, 2010, when his guest was the great Nora O’Connor. 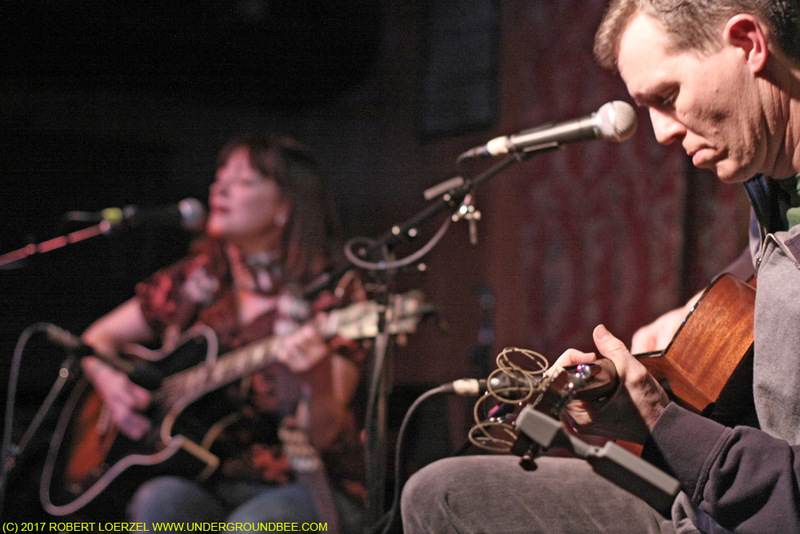 Robbie Fulks performs with Nora O’Connor during the second show of his Hideout residency, on February 8, 2010. Fulks and O’Connor played some old-timey bluegrass and gospel tunes, such as “The Lost Indian” and Flatt and Scruggs’ “Take Me in Your Lifeboat.” Of course, they played some of their own songs as well — a couple of recent Fulks songs and a couple of oldies, plus some of the best tracks off O’Connor’s excellent (and thus far only) solo record, 2004’s Til the Dawn. And some cool covers: Fulks taking the lead on George Jones’ “The Flame In My Heart,” and O’Connor singing M. Ward’s “Helicopter,” Fleetwood Mac’s “That’s Alright” and Ketty Lester’s “Love Letters.” In between songs, Fulks was as funny as ever with his stage banter. As Fulks remarked, how can you go wrong with two people playing acoustic guitars and singing? That evening set the template for many shows that followed: a few pals casually playing songs together, including tunes they know very well — plus songs they’re just figuring out how to play. With talented and skilled musicians, that kind of performance hits a sweet spot: You can hear them testing themselves and exploring the notes. You can see them reacting to what they’re hearing from the other folks onstage. Q: What do you mean by the idea of rehearsal? Fulks: If you have a one-time-only show, but it has a lot of curves in it, a lot of things that you need to go over, like, how do you efficiently go over that with five or six people? And that’s been interesting to sort through. In the old days, I would have had one or two rehearsals within the week of the show. And then later, I would kind of run minimal parts of the show at 5 that afternoon — an hour or two before doors — and just kind of race through it. And when you see the results of the one thing, a thorough-going rehearsal, versus the results of the other, you start to think, ‘Well, maybe you don’t need to rehearse at all.’ You know? Because it’s not that different. The results aren’t that different. So I’ve tried some shows without rehearsing at all. (Laughs.) I tried everything in between. And I’ve learned that there’s not a consistently reliable way to do it — so that the results will be, you know, error-free. But less is probably better. Q: Well, I was going to say, one of the things I enjoy most about your Monday-night shows is that you often have you and some other musicians playing together, who obviously haven’t played the songs a zillion times — they don’t know them that well — but you’re good enough musicians that you can figure out things by ear, and if you make a little mistake, it’s not that noticeable. So that sort of “well played but not over-rehearsed” quality is what I find so appealing about it. Q: What was the song? Fulks: “Cherokee Shuffle.” It’s a song that every flat-picker knows very well. And I thought I knew. But I got it confused with another fiddle tune. I missed that particular performance — but that sort of train-wreck moment is a key to why these shows were so great. By daring to fail, Fulks and the other musicians sometimes achieved almost transcendental beauty. Sure, they failed occasionally — very occasionally — but even those few off-key notes or flubbed lyrics were interesting or humorous. 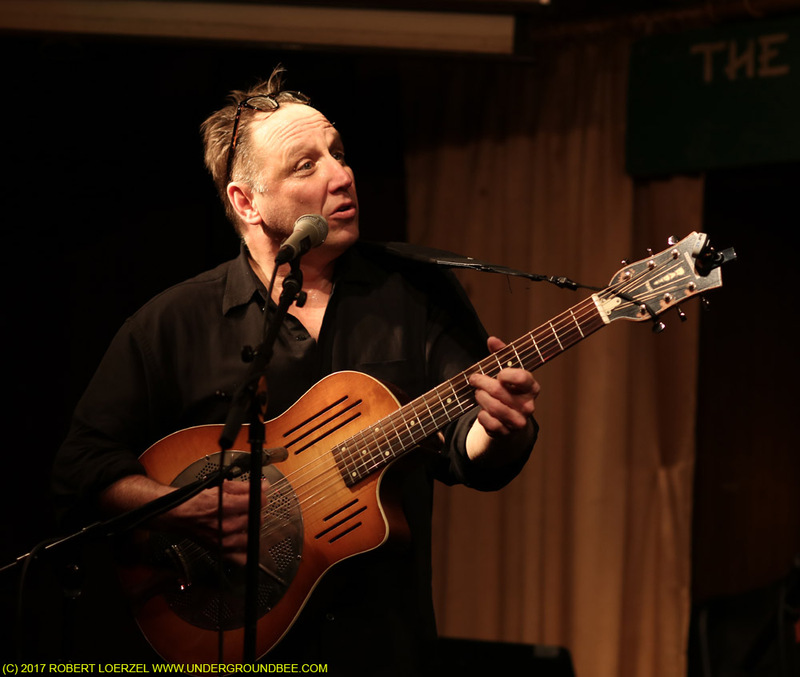 Don Stiernberg performs with Fulks on December 5, 2016. Gjersoe probably played with Fulks more than anyone else, including duo shows as well as performance by groups like the Pussycat Trio (Fulks and Gjersoe plus Beau Sample) or the Scavengers (Fulks and Gjersoe plus Gerald Dowd, Casey McDonough). 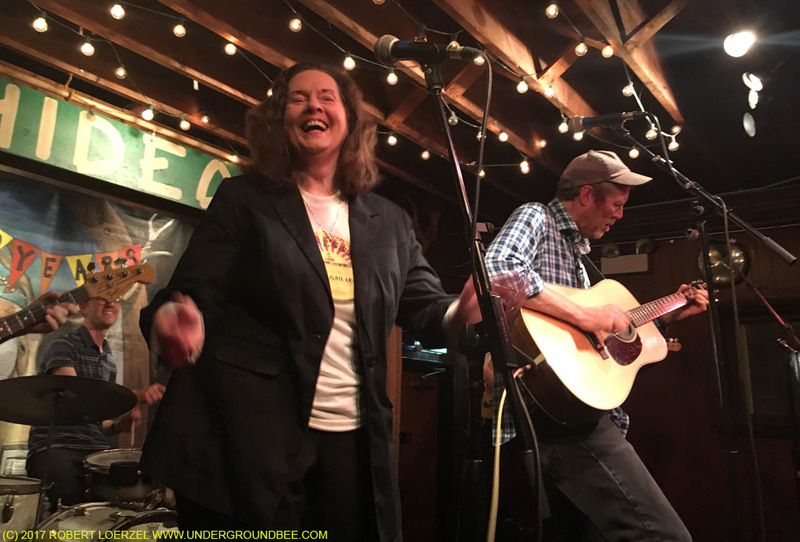 Linda Gail Lewis performs with Robbie Fulks on August 29, 2016. Around Christmastime, Fulks would bring in Steve Dawson and Diane Christiansen from the band Dolly Varden to sing songs about Jesus Christ. 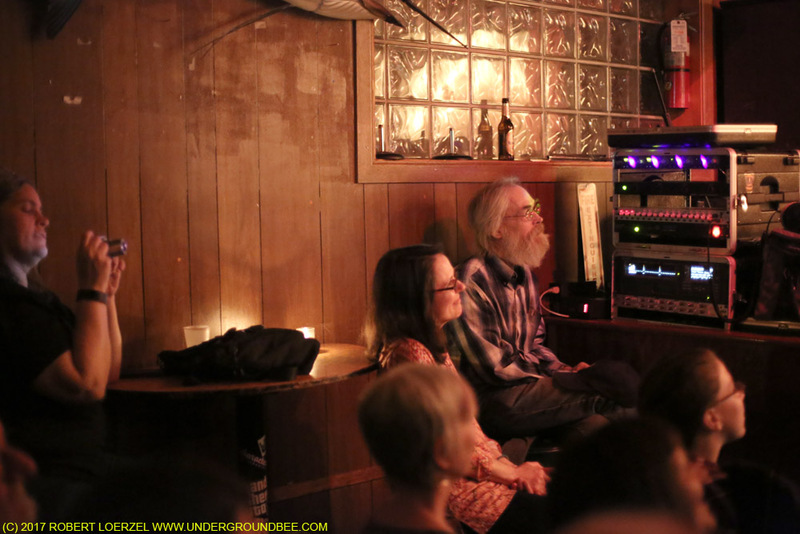 Memorably, the power went out in the middle of the first song, the Velvet Underground’s “Jesus,” during the show on December 8, 2014. The “Jesus Christ Trio,” as they called themselves, continued playing, without the benefit of electricity, for the next hour in near darkness — and it was magical. Fulks takes a guitar solo during the “Carter Family Jazz Style” show on March 28, 2016, with Jason Adasiewicz, Kent Kessler and Gerald Dowd. On some nights, Fulks and his guests covered entire albums: The Flying Burrito Brothers’ The Gilded Palace of Sin, Gram Parsons’ Grievous Angel, Elvis Costello’s Get Happy!! !, Bob Dylan and the Band’s The Basement Tapes (video of “Tears of Rage”) and Bob Dylan’s Slow Train Coming and Street Legal. (The experience of covering Dylan’s overlooked 1978 album Street Legal with rich, full-band arrangements was so rewarding that Fulks has begun working on a studio recording of the whole thing.) On July 21, 2014, Oscar-nominated actor Michael Shannon — whom I’d spotted in the audience at an earlier Fulks gig — handled all the lead vocals for a performance of Lou Reed’s The Blue Mask. 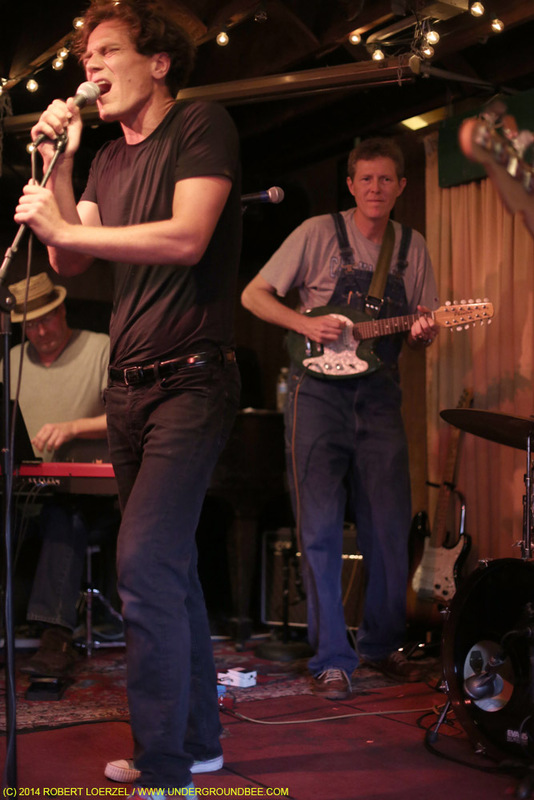 Fulks plays guitar as Michael Shannon sings the Lou Reed album The Blue Mask on July 21, 2014. The most inventive shows may have been those in which Fulks and his collaborators mashed together two unlikely musicians or styles: Thelonious Monk vs. The Monkees (video of “I’m A Believer”), Graham and Charlie Parker, Jazz Does The Carter Family, Jerry v. Lou Reed (video of the “Amos Moses” and “Sweet Jane” mashup), Merle Travis vs. Miles Davis, and Leonard Cohen v. Lynyrd Skynryd (video of “Freebird”). In one of the more bizarre episodes, Fulks reacted to a 2012 National Enquirer story that referenced his music. Certain artists and themes drew big crowds — “big” being a relative term, when you’re talking about a venue that holds around 100 people. On many nights, there were just 25 or 30 people in the room. Country singer-songwriter Lydia Loveless made an unexpected cameo on February 3, 2015, when she was stuck in Chicago because of bad weather. 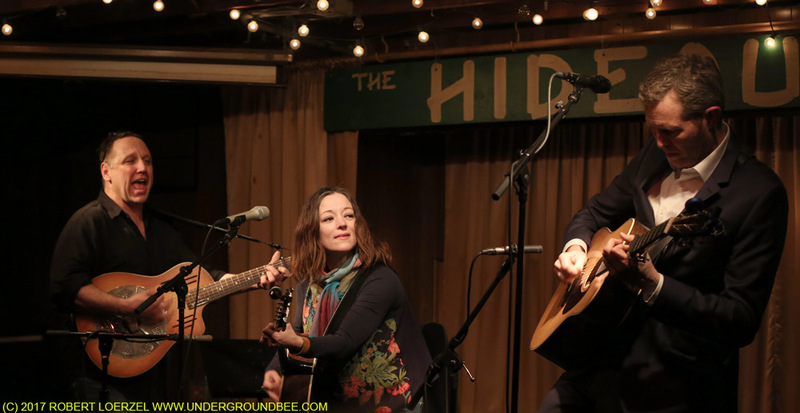 After sitting in the audience, she came up onstage to sing a few songs with Fulks, and he explained the Hideout’s Monday-night vibe to her. “It’s a crowd of 30, but it responds like a crowd of 22,” he joked. Oh, yeah — he also made some great records while all of this was going on. …in case anyone’s interested, that the reason I’m ending is that it just seems like the right time to. I had something to accomplish in starting the Mondays; I’m not sure I could have defined it precisely and not sure I did accomplish it after all, but whether I did or didn’t, it’s certainly past time to proceed to the next fuzzily defined idea or goal. If feeling more comfortable in performance was a goal, I can say without much self-love that I’m there! If it was to learn new songs made by other people, I suppose I’ve learned about 1,500 since 2010, and forgotten all but maybe 200. Not much achieved there, but a little. If it was to augment my guitar skills…hmm. Maybe. Probably not. On February 6, Nora O’Connor was back, and her singing sounded as exquisite as ever. A cover of the Handsome Family’s “So Much Wine” gave me goosebumps. Another Monday-night stalwart, Kelly Hogan, joined O’Connor and Fulks for a couple of songs. 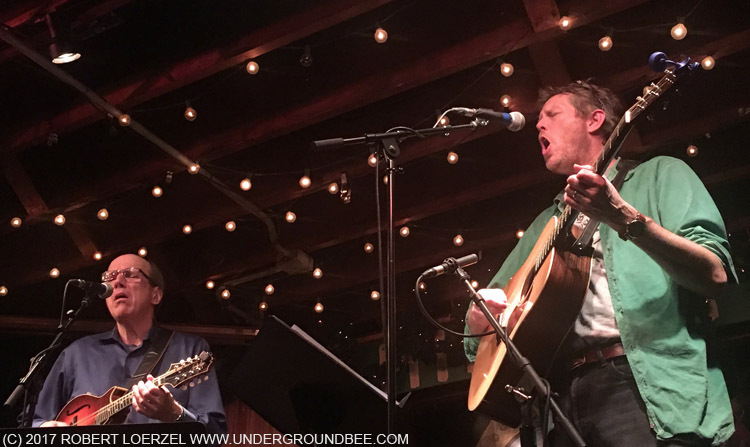 The set included songs by Loudon Wainwright III (video), Jimmy Driftwood (video), Dan Penn (video) and Bobby Braddock (video). On February 20, Fulks presented the Austin bluegrass band High Plains Jamboree, and he stepped out of the spotlight for most of the night, playing guitar alongside the group. I became a fan of High Plains Jamboree when the group played with Fulks on a Monday night last year, and this return appearance was just as wonderful. In the middle of the concert, singer-mandolinist Brennen Leigh performed several duets with Fulks, including “The Angels Rejoiced” by the Louvin Brothers (video) and a rousing gospel song, “He Will Set Your Fields On Fire,” by James and Martha Carson — which had Fulks singing one set of words in the chorus while Leigh simultaneously sang other lyrics. The cheers after that song were long and loud. “I knew we had some angry Christians here,” Fulks joked. High Plains Jamboree played two terrific politically themed songs — from an album that’ll be coming out later this year — one about illegal immigration called “El Coyote” (video) and another timely protest number titled “You Ain’t Laying No Pipeline” (video). When Fulks sang one of his own songs, “Sometimes the Grass is Really Greener,” he responded to the sight of High Plains Jamboree’s old-fashioned-looking microphones by saying it made him feel like Walter Winchell — and then he proceeded to sing a verse in a old-timey radio-announcer voice. And then he added an impressive yodel to the song, earning a big round of applause. 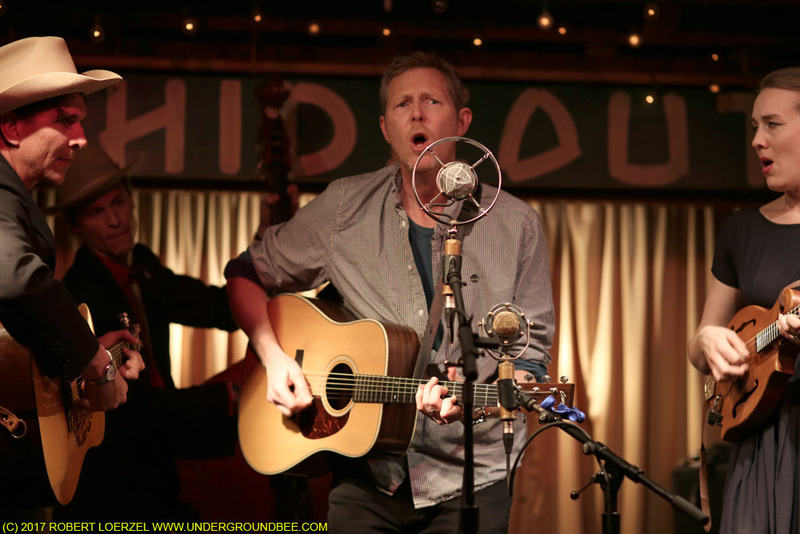 Robbie Gjersoe, Nora O’Connor and Robbie Fulks during the final show of Fulks’ Monday-night residency at the Hideout, on February 27, 2017. For the grand finale, on February 27, Fulks played with the same guy who helped him start off the entire series seven years ago, Robbie Gjersoe. They originally met through one of those old Chicago Reader classified ads where musicians try to find people with similar musical tastes to start a band. Gjersoe is a master guitarist, especially adept at playing with a slide. 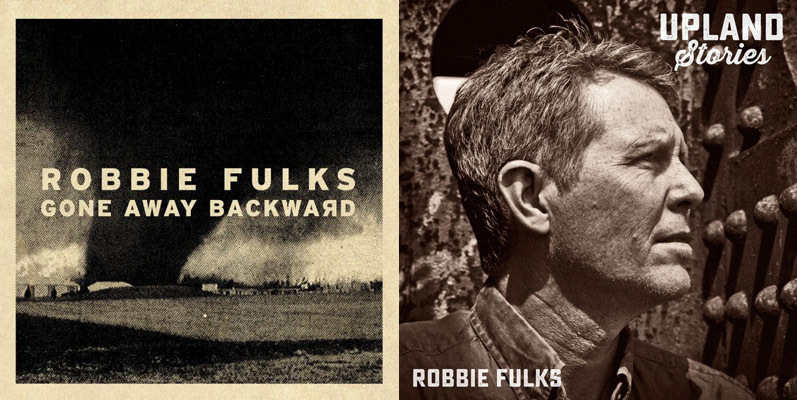 The parts he adds to Fulks’ songs remind me of the essential contributions that Dave Rawlings makes to Gillian Welch’s music. Whenever these two Robbies play together, it’s a joy to see two guitarists with so much talent playing off each other. “The Robbie and Robbie show is my favorite of all of them,” Nora O’Connor remarked when she joined them onstage during this final show for a few songs. 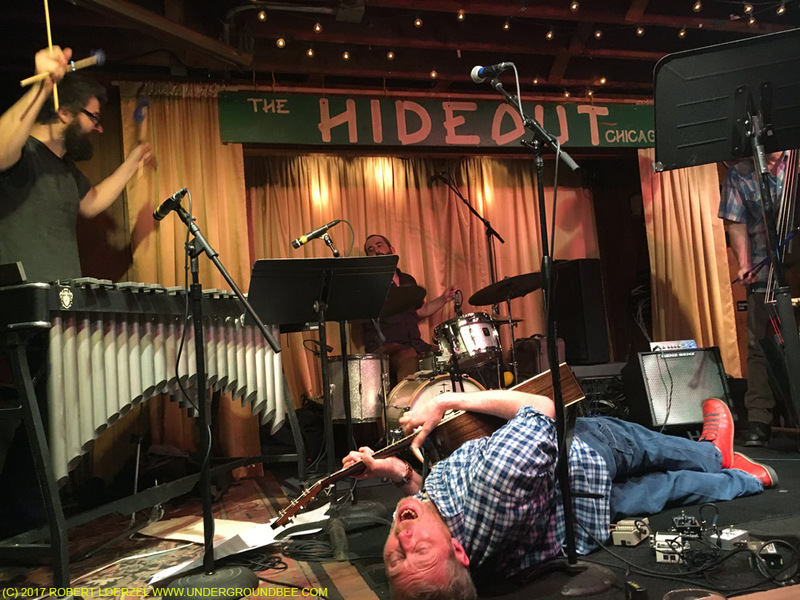 Fulks isn’t actually gone, of course — he still plans to play concerts in the Chicago area and elsewhere — but plenty of folks are sure gonna miss seeing Robbie on Monday nights at the Hideout. 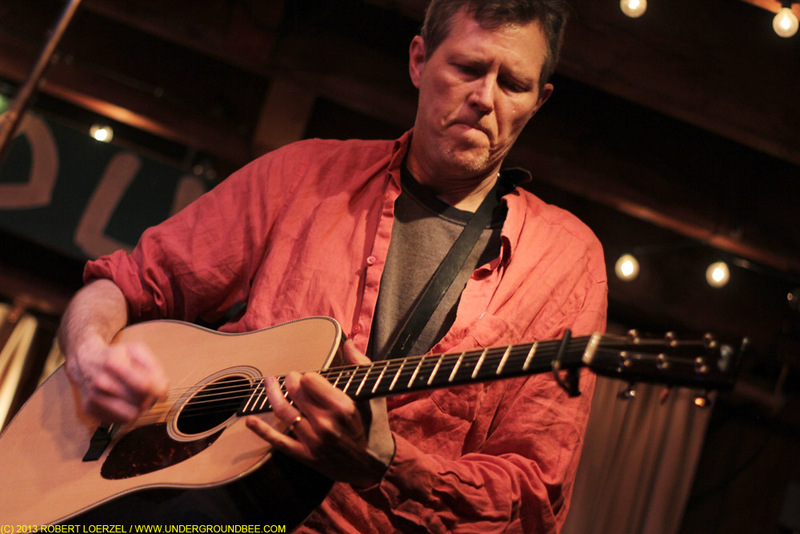 Robbie Fulks exits with his guitar in hand at the end of his February 6, 2017, show with Nora O’Connor.